Found this recipe on opensourcefood.com by Mousie. We will have to guess at how many this makes and how easy it is! Whip egg whites until stiff. So stiff it won't drop out of the bowl when you turn it upside down. Mix both cheeses together, together with the herbs and salt and pepper. Fold in the whipped egg whites. Add in the flour and mix all together. 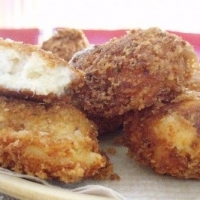 Make cheese balls by using two tablespoons, and rolling them around in the bread crumbs. Heat up enough oil to deep fry the balls. I find if a wooden chopstick bubbles slightly when dipped into the oil means that the oil is hot enough. Fry until golden brown, and when taking them out, be careful not to poke them, or all the cheese will ooze out. Mercy yes, these sound delicious! Definitely saved for trying soon...thanks!! I Agree w/Krum, Marinara Would Be The Ultimate Finisher For These Tidbits Of Perfection. Looks and sounds very tasty! Thanks for sharing this! Man, those look good - and RICH! I bet a dip of marinara would be nice on the side maybe? They look so gooey and tasty - can't wait to try them! Like janetk's recipes? Never miss an upload!